Furthermore, the three species lack a tibial apophysis in males and share a distinctive color pattern ontogeny that is not known in any other Avicularia species. The conservation status of the three species is discussed, especially with respect to endemism, illegal trafficking and habitat destruction. The creation of protected areas in southern State of Bahia, Brazil, is recommended, as well as the inclusion of these species in IUCN and CITES lists. Appendices with figures and species information. custom officers, in order to limit illegal traffic. Mygale diversipes C. L. Koch 1842: 65, pl. CCCX, f. 731. Bonnet 1955: 1831; 1957: 2990. F. O. P.-Cambridge 1896: 744; Platnick 2008.
leg I; it is distinguished by the embolus being more than four times longer than the tegulum, with a strong curvature (Figs 1─3). Additionally, the male and female have distinct orange longitudinal stripes over the tarsi and metatarsi dorsum and a blue sheen on prolateral and retrolateral areas of the legs (Figs A1─A3). 39o13’ W], R. Bertani & G. Puorto col., March 1991 (IBSP 119271 reference 64.583). Additional material examined: BRAZIL: Bahia: Elísio Medrado, RPPN Jequitibá (12°52'3.20'' S,39°28'9.09" W), 1 female, R. Bertani, C.S. Fukushima and R.H. Nagahama, 7 October 2007 (MZSP 29073); Ilhéus, CEPLAC [14o46' S, 39o13’ W], CEPLAC 86, T 71, 1 female, 1 immature male, U. Caramaschi, 10–13 March 1986 (MNRJ 12927); 1 female, R. Bertani and G. Puorto, March 1991 (IBSP 11754); 2 immatures, same data and collectors (IBSP 119271 ref. 64583); 1 female, R. Bertani and G. Puorto, February 1991 (IBSP 7886); 1 female, R. Bertani, January 1992, (IBSP 119272 ref. 67365); 1 female, R. Bertani, 24 April 1998, (IBSP 9531); Jussari, RPPN Serra do Teimoso [15°12' S, 39°29' W], 1 female found on bush at night, R. Bertani and A.D. Brescovit, 9 April 1998 (IBSP 7921); Lomanto Júnior [14o47’ S, 39o27’ W], Fazenda São José, R 2429, 1 female, 9 immatures, 4 November 1968 (MNRJ 12944); Uruçuca [14º35’ S, 39°17’ W], Itabuna zone, CEPLAC, R 3001, 1 female, 2 immatures, N. Tingarine (MNRJ 13761). FIGURES 1─4. Avicularia diversipes. 1─3 Male left palpal bulb (IBSP 119271). 1, prolateral, 2, retrolateral, 3, frontal. 4, Female spermatheca (IBSP 11754) dorsal. Scale bar = 1mm. Redescription: Female IBSP 11754. Carapace 15.6 long, 15.2 wide, chelicerae 6.3. Legs (femur, patella, tibia, metatarsus, tarsus, total): I: 12.0, 7.4, 9.2, 9.4, 5.1, 43.1. II: 11.6, 7.4, 9.1, 8.4, 4.6, 41.1. III: 10.4, 6.0, 7.5, 8.0, 4.3, 36.2. IV: 12.8, 6.6, 10.5, 11.6, 4.2, 45.7. Palp: 8.9, 5.6, 5.6, –, 5.9, 26.0. Midwidths: femora I – IV=2.4, 2.7, 2.8, 2.4, palp=2.5; patellae I–IV=2.8, 2.7, 2.9, 2.7, palp=2.4; tibiae I–IV=2.6, 2.3, 2.5, 2.5, palp=2.4; metatarsi I–IV=2.2, 2.2, 2.0, 1.7; tarsi I–IV=2.5, 2.3, 2.2, 2.2, palp=2.6. Abdomen 17.0 long, 11.1 28 · Magnolia Press BERTANI & FUKUSHIMA wide. Spinnerets: PMS, 1.8 long, 0.8 wide, 0.1 apart; PLS, 1.7 basal, 1.7 middle, 1.7 distal; midwidths 1.2, 1.4, 0.9, respectively. Carapace: ratio of length to width. 1.02; cephalic area moderately raised, thoracic striae inconspicuous. Fovea: shallow, straight, 2.49 wide. Covered by short, slender setae and some long scattered setae mainly in cephalic region. Eyes: tubercle high, length 2.7, width 3.4. Clypeus 0.3 wide. Anterior eye row procurved, posterior slightly recurved. Eyes sizes and inter-distances: AME 0.75, ALE 0.85, PME 0.37, PLE 0.73, AME–AME 0.60, AME–ALE 0.52, AME–PME 0.24, ALE–ALE 2.34, ALE–PME 0.42, PME–PME 2.05, PME–PLE 0.11, PLE–PLE 2.48, ALE–PLE 0.52, AME–PLE 0.63. Ratio of eye group width to length 2.10. Maxillae: length to width: 1.62. Cuspules: 100─200 spread over ventral inner heel. Lyra absent. Labium: length 1.7, width 3.2, with 98 cuspules spaced by more than one diameter from each other on anterior third centrally. Labio-sternal groove shallow, flat, with two slightly separate, large sigilla. Chelicerae: rastellum absent; basal segments with eight teeth decreasing in size from distal area and row of small teeth on promargin. brown with metallic green/blue iridescence (Fig. A2). Dorso-medial conspicuous orange stripe along all tarsi and sinuous on metatarsi (Figs A1─A2). Orange rings on distal tibiae and metatarsi (Fig. A1). Abdomen black with brownish anterolateral areas, with some long red hairs (Fig. A1). Description: Male IBSP 119271, reference 64.583. Carapace 13.1 long, 12.9 wide, chelicerae 5.8. Legs (femur, patella, tibia, metatarsus, tarsus, total): I: 13.4, 6.7, 10.6, 11.0, 6.1, 47.8. II: 12.2, 6.6, 10.1, 10.3, 5.9,45.1. III: 11.4, 5.6, 9.2, 9.6, 4.6, 40.4. IV: 13.7, 6.1, 11.4, 14.4, 5.0, 50.6. Palp: 7.8, 4.7, 6.9, –, 3.1, 22.5. Midwidths: femora I –IV=2.3, 2.4, 2.6, 2.2, palp=1.7; patellae I–IV=2.3, 2.2, 2.4, 2.3, palp=1.9; tibiae I– IV=2.0, 1.7, 1.9, 1.9, palp=2.2; metatarsi I–IV=1.3, 1.3, 1.2, 1.3; tarsi I–IV=1.4, 1.4, 1.3, 1.4, palp=1.8. Abdomen 12.6 long, 7.2 wide. Spinnerets: PMS, 1.1 long, 0.6 wide, 0.1 apart; PLS, 1.6 basal, 1.2 middle, 1.8 distal; midwidths 1.2, 1.0, 0.7, respectively. Carapace: length to width 1.01; cephalic area not raised. Fovea 0.96 wide. Carapace covered by short, slender setae and many longer scattered hairs. Row of very long setae from eye tubercle to fovea. Eyes: tubercle length 2.1, width 2.6. Clypeus absent. Posterior eye row recurved. Sizes and interdistances: AME 0.68, ALE 0.65, PME 0.24, PLE 0.49, AME–AME 0.40, AME–ALE 0.36, AME–PME 0.15, ALE–ALE 1.52, ALE–PME 0.61, PME–PME 1.71, PME–PLE 0.02, PLE–PLE 2.18, ALE–PLE 0.47, AME– PLE 0.36. Ratio of eye group width to length 1.82. Maxillae: length to width: 1.92. Cuspules: ca. 80 spread over ventral inner heel. Lyra absent. Labium: length 2.2, width 1.4, with 38 cuspules spaced by more than one diameter from each other on anterior third centrally. Labio-sternal groove with two separated large sigilla. Chelicerae: basal segments with three well developed teeth, six medium teeth, one small tooth and row of small teeth on promargin. Sternum: length 6.84, width 5.92. Sigilla: three pairs, posterior ellipsoidal, set at 45° angle, one diameter from margin; middle fusiform, more than one diameter from margin; anterior not visible. Legs. Clavate trichobothria: on distal 2/3 of tarsi I and II; distal 3/4 of tarsi III and IV. Scopula: tarsi I–IV fully scopulate, without dividing or sparse setae; metatarsi I–II fully scopulate; III for distal 2/3; IV, 2/5 distally scopulate; IV divided by a three-setae-wide row. Tibial apophysis absent, distal prolateral area of tibia I with concentration of stiff setae. Palp: embolus slender, more than 3 times longer than tegulum, strongly curved at base by more than 180° to retrolateral side (Figs 1─3). Cymbium: two subequal lobes; prolateral one triangular in shape, with short spiniform process on apex. Color pattern ontogeny: As happens with other aviculariines, the color pattern of these spiders changes during their development. After leaving the eggsac, the spiderlings have an overall metallic green color; the abdomen dorsum has a central longitudinal darker green stripe with zigzag edges in which lies a long spot with the same color of the lateral abdomen (light yellowish green). Four darker green transverse stripes connecting to the central longitudinal stripe can be noted on each side. The carapace center is also dark green, which contrasts with the lighter lateral area (Fig. A4). In larger stadia, the legs and central carapace are still metallic green but the central longitudinal dark green stripe with zigzag edge on dorsal abdomen becomes black. At the same time, the long spot on abdomen becomes a vivid red (Fig. A5). As the individuals grow, they become brownish. The tarsi and metatarsi gain a vivid orange stripe. The legs show an intense blue metallic sheen and the central long spot on the abdomen remains red (Fig. A3). Adult males and females have the carapace and legs brown whereas a metallic blue/green sheen will remain in the prolateral and retrolateral areas of the legs (Figs A1─A2). The orange marks on dorsal tarsi and metatarsi are normally conspicuous (Figs A1─A2). The abdominal longitudinal central spot fades completely becoming almost completely black. Little of the juvenile abdominal color pattern remains in the adult as the anterolateral brownish spots on abdomen. Recently molted specimens have more vivid colors and more distinguishable patterns as observed in other theraphosids. In premolting individuals, the general pattern is more difficult to distinguish. Distribution: Southern State of Bahia, Brazil (Fig. 17). Natural History: Spiders in Ilhéus (CEPLAC) were found mainly in a forested area occupied formerly by cocoa plantation and now regenerating over 30 years (Argôlo 2004). They make retreats on the vegetation, which are constructed in a similar way to those in Iridopelma spp. specimens, with two leaves connected with silk (Fig. 14). Many individuals were seen lying on broad leaves of Heliconiacea (Fig. 13). Some individuals were found in bromeliad leaves (Fig. 15) and others walking on tree trunks. The population in this forested area is the densest we have seen, with one to two dozen individuals seen each night. Collections in experimental cocoa crops near this area yielded a few specimens. However, only a single specimen was taken in a one day collection in a primary forest area (Jussari). Therefore, the relation between area types (forest vs cocoa crops) and the specimen density is not clear, since the difference on the number of observed individuals can be influenced by other variables such as the season of the year and period of day in which the observations were made. Thus, since there were no systematic collect efforts to estimate and compare the populations, it is not possible to affirm if there are population differences between the two area types. One female was found walking on a tree trunk two meters above the ground at night on Reserva Jequitibá in Bahia. Its retreat was not found. This specimen was collected in the same area on the Reserva Jequitibá where the specimens of A. gamba sp. nov. were found (see A. gamba sp. nov. natural history below). spiniform process on the cymbium and a longitudinal black stripe on the dorsocentral red abdomen (Fig. B1). The female resembles A. gamba sp. nov. by retaining the characteristic juvenile color pattern on the abdomen (Fig. B2) and by the spermathecae shape (Fig. 8). It can be distinguished from those of A. gamba sp. nov. by having spermathecae with a multilobular apex (Fig. 8) and a single red spot inside the central longitudinal black stripe on dorsal abdomen (Fig. B2). Etymology: The specific name refers to the type locality, the Reserva Biológica de Sooretama. Material examined: Holotype male, Brazil, State of Espírito Santo, Reserva Biológica de Sooretama [18o59’S 40o07’W], at night, AMNRJ, 18 April 2006 (MNRJ 18435); paratype female, Brazil, State of Espírito Santo, Pinheiros, Reserva Biológica Córrego do Veado (18o37’0.16"S 40o14’1.60"W), 71 m a.s.l., AMNRJ, 22 October 2005 (MNRJ 12930). Additional material examined: BRAZIL: Bahia: Itamaraju [17o03’ S, 39o32’ W], Fazenda Pau Brasil, CEPLAC, R 3000, 1 female, 22 December 1969 (MNRJ 12920); Itamaraju zone [17o03’ S, 39o32’ W] or Fazenda Furtado, Prado, CEPLAC, R 3049, 1 immature male, 2 immatures (MNRJ 13798); Prado, CEPLAC, R 3134, 1 male (MNRJ 13791); Teixeira de Freitas [17o31’ S, 39o44’ W], 1 male, Cooperativa Agrícola de Cotia, April 1981 (IBSP 4680); Una, Reserva Biológica do Una [15º09’ S, 39º02’ W], on forest floor, 1 male, A.D. Brescovit and R. Bertani, April 1998 (IBSP 9714); 1 immature female, same collectors, 13 April 1998 (IBSP 8066); Espírito Santo: Conceição da Barra [18º35’ S, 39º43’ W], Floresta Nacional de Rio Preto, 1 female, U. Caramaschi and H. D. Niemeyer col., 27–31 January 1998 (MNRJ 12949); Linhares [19o06’ S, 39o56’ W], Reserva Natural da Companhia Vale do Rio Doce, 1 immature female, A.D. Brescovit et al. (IBSP 8600); Linhares, Floresta Nacional de Goytacazes [19o26’ S, 40o04’ W], in afternoon, 1 immature female, 25 October 2005 (MNRJ 12915); Pinheiros [18o20’ S, 40o08’ W], Reserva Biológica Córrego do Veado (18o37’0.16"S 40o14’1.60"W), 71 m a.s.l., 2 immature females (MNRJ 12917); 1 female (MNRJ 12954); 1 immature male (MNRJ 12916), AMNRJ, 12–26 October 2005; Sooretama, Reserva Biológica de Sooretama [19°00' S 40°07' W], estrada do Paraisópolis, during day, 1 immature, AMNRJ, 19 April 2006 (MNRJ 18436); Rio de Janeiro: Itatiaia [22o19’ S, 44º35’ W], Parque Nacional de Itatiaia, Casa do Lago Azul, 780 m a.s.l., 1 female, 30 May 1956 (IBSP 3478). Description: Holotype male. Carapace 10.8 long, 9.0 wide, chelicerae 4.7. Legs (femur, patella, tibia, metatarsus, tarsus, total): I: 11.8, 5.9, 10.6, 9.5, 5.3, 43.1. II: 10.6, 5.4, 9.2, 8.5, 4.5, 38.2. III: 9.8, 4.2, 7.7, 8.5, 4.1, 34.3. IV: 12.3, 5.2, 11.6, 11.8, 4.3, 45.2. Palp: 6.4, 3.5, 4.7, –, 1.6, 16.2. Midwidths: femora I–IV=1.9, 2.0, 2.1, 1.9, palp=1.5; patellae I–IV=1.5, 1.9, 2.0, 2.0, palp=1.7; tibiae I–IV=1.4, 1.4, 1.6, 1.8, palp=1.5; metatarsi I–IV=1.2, 1.1, 1.0, 1.1; tarsi I–IV=1.1, 1.2, 1.1, 1.0, palp=1.3. Abdomen 10.3 long, 6.2 wide. Spinnerets: PMS, 1.2 long, 0.5 wide, 0.1 apart; PLS, 1.1 basal, 0.8 middle, 2.0 distal; midwidths 0.9, 0.8, 0.6, respectively. Carapace: length to width 1.2; cephalic area not raised, thoracic striae inconspicuous. Fovea: shallow, straight, 1.0 wide. Carapace covered by short, slender setae and some long scattered setae mainly in cephalic region. Eyes: tubercle high, length 1.8, width 2.3. Clypeus absent. Anterior eye row procurved, posterior slightly recurved. Sizes and inter-distances: AME 0.66, ALE 0.53, PME 0.21, PLE 0.41, AME–AME 0.42, AME– ALE 0.34, AME–PME 0.11, ALE–ALE 1.48, ALE–PME 0.48, PME–PME 1.39, PME–PLE 0.02, PLE–PLE 1.78, ALE–PLE 0.33, AME–PLE 0.30. Ratio of eye group width to length, 2.10. Maxillae: length to width: 1.65. Cuspules: 100─200 spread over ventral inner heel; lyra absent. Labium: length 1.2, width 1.5, with ca. 130 cuspules spaced by more than one diameter from each other on anterior third centrally. Labio-sternal groove shallow, flat, with two slightly separate large sigilla. Chelicerae: rastellum absent, basal segments with nine teeth in row and some small teeth on promargin. Sternum: length 5.4, width 4.1. Posterior angle sharp, but not separating coxae IV. Sigilla not evident. Legs: legs formula: IV=I II III. Clavate trichobothria on distal half of tarsus I and 2/3 of tarsi II–IV. Leg coxae with sparse soft setae; no stridulatory or modified setae. Scopula: tarsi I–III fully scopulate, IV divided by row three setae wide; metatarsi I–II fully scopulate; III for distal 2/3; IV 2/3 distal scopulate. IV divided by three-wide row of setae. Scopula hairs longest at lateral areas of tarsi and metatarsi, giving spatulate aspect to Zootaxa THREE BRAZILIAN AVICULARIA SPECIES 2223 © 2009 Magnolia Press · 31 articles. Spines: entirely absent. Claws: ITC absent; STC without teeth. Tibial apophysis absent, distal prolateral area of leg I tibia with concentration of stiff setae. Urticating hairs: Type II on abdomen dorsum. Palp. Embolus slender, long, three times longer than tegulum, with curvature of roughly 90° to retrolateral side (Fig. 5─7). Cymbium: two subequal lobes, prolateral one triangular, with very short spiniform process on apex. Color pattern: dark brown carapace bordered with light brown hairs; all legs and pedipalps dorsally dark brown, femora darker. All appendages and carapace covered with light brown hairs with pinky sheen. Sternum, labium, maxillae, coxae and legs ventrally brown. Leg rings on distal femora, tibiae and metatarsi pinkish. Reddish hairs and broad black stripe over central area on dorsal abdomen (Fig. B1). Description: Paratype female. Carapace 10.5 long, 8.8 wide, chelicerae 4.7. Legs (femur, patella, tibia, metatarsus, tarsus, total): I: 8.1, 5.0, 6.1, 5.0, 3.6, 27.8. II: 7.4, 4.7, 5.9, 4.8, 3.6, 26.4. III: 6.6, 3.9, 5.1, 4.7, 3.5, 23.8. IV: 9.0, 4.7, 7.5, 6.9, 3.9, 32.0. Palp: 5.4, 3.5, 3.4, –, 3.9, 16.2. Midwidths: femora I–IV=1.8, 1.6, 2.2, 1.8, palp=1.3; patellae I–IV=2.0, 1.9, 1.9, 2.0, palp=1.6; tibiae I–IV=1.8, 1.7, 1.8, 2.0, palp=1.7; metatarsi I– IV=1.6, 1.4, 1.4, 1.4; tarsi I–IV=1.6, 1.5, 1.4, 1.4, palp=1.7. Abdomen 11.5 long, 8.4 wide. Spinnerets: PMS, 1.3 long, 0.6 wide, 0.1 apart; PLS, 2.0 basal, 1.2 middle, 2.3 distal; midwidths 1.2, 1.0, 0.8, respectively. As in male, except: Carapace: length to width 1.2; Fovea: 1.6 wide. Eyes: tubercle 1.7 long, 2.3 wide. Sizes and inter-distances: AME 0.66, ALE 0.53, PME 0.21, PLE 0.41, AME–AME 0.42, AME–ALE 0.34, AME–PME 0.11, ALE–ALE 1.48, ALE–PME 0.48, PME–PME 1.39, PME–PLE 0.02, PLE–PLE 1.78, ALE–PLE 0.33, AME–PLE 0.30. Ratio of eye group width to length, 2.0. Maxillae: length to width: 1.6. Labium: length 1.2, width 2.0, with 35 cuspules spaced by more than one diameter from each other on anterior third centrally. Labio-sternal groove without discernible sigilla. retrolateral, 7, frontal. 8 Female paratype (MNRJ 12930), spermathecae, dorsal. Scale bar = 1mm. Chelicerae: basal segments with 12 teeth in row and three small teeth on promargin. Sternum: length 5.0, width 4.1. Legs. Clavate trichobothria on distal 2/3 of tarsus I–IV. Metatarsi III–IV 2/3 distally scopulate. Genitalia: Two spermathecae, at basal third curving to external side in 90° angle, having folds in two thirds of distal part and ending in multilobular apex (Fig. 8). Color pattern: carapace brown bordered with light brown hairs; all legs and pedipalps dorsally brown and light brown hairs with pinky sheen. Sternum, labium, maxillae, coxae and legs ventrally brown. Leg rings on distal femora, tibiae and metatarsi pinkish. Abdomen dorsally light brown with large longitudinal central black stripe with zigzag edges in which lies a red spot on posterior half and three ill-defined black stripes connected to the central one on each side (Fig. B2). Color pattern ontogeny: Even though we examined only a few specimens in different stadia, the color pattern ontogeny of A. sooretama sp. nov. seems to be similar to that of A. diversipes (cf. Figs A4─A5) and A. gamba sp. nov. (cf. Figs C3─C5). The main difference in the color of the spiderlings is the shorter central long spot on the dorsal abdomen does not reach its most anterior portion (Fig. B3) as in A. diversipes and A. gamba sp. nov. Other differences from A. diversipes are the lack of orange markings on the tarsi and metatarsi both in large juveniles and adults (Figs B1─B3). Adult males of A. sooretama sp. nov. have a pinky sheen all over the body and present a longitudinal central black stripe over the red abdomen (Fig. B1). Adult females of A. sooretama sp. nov. seem to retain the juvenile color pattern (Fig. B2). Distribution: Extreme south of State of Bahia to southern Rio de Janeiro, Brazil (Fig. 17). Natural History: The specimens collected in Reserva Biológica de Sooretama were found walking on leaves and over a tree trunk at night (R. Nagahama, pers. com.). Diagnosis: The male resembles those of A. diversipes and A. sooretama sp. nov. by lacking a tibial apophysis on leg I. It is distinguished from that of A. diversipes by the embolus being 3.5 times longer than the tegulum, with a curvature of less than 180° (Figs 9─11) and by the absence of orange stripes on the metatarsi. The male can be distinguished from that of A. sooretama sp. nov. by the absence of a spiniform process on the cymbium. The female resembles those of A. sooretama sp. nov. by retaining the characteristic juvenile color pattern on the abdomen (Fig. C2) and by the spermathecal shape (Fig. 12). It is distinguished by having spermathecae constricted at its base, slightly curved outwards and ending in rounded apex (Fig. 12). The male and female can be additionally distinguished from those of A. diversipes and A. sooretama sp. nov. by having leg I slightly longer than leg IV, rather than leg I slightly shorter than leg IV. Etymology: The specific name is taken from the NGO "GAMBA – Grupo Ambientalista da Bahia", in recognition of their efforts in preserving Brazilian Atlantic rainforest remnants in the State of Bahia. The area in the RPPN Jequitibá where the new species was discovery is protected by GAMBA's initiative. Material examined: Holotype male, Brazil, State of Bahia, Elísio Medrado, RPPN Jequitibá (12°52'3.20'' S, 39°28'9.09" W), R. Bertani, C.S. Fukushima and R.H. Nagahama, 7 October 2007, collected at night, found immature inside a retreat made with silk and leaves, matured in captivity on June 2009 (MZSP 31115); paratype female, same data and collectors (MZSP 31116). Additional material examined: molts of live specimens maintained in laboratory. Description: Holotype male. Carapace 7.3 long, 6.9 wide, chelicerae 2.1. Legs (femur, patella, tibia, metatarsus, tarsus, total): I: 9.3, 4.6, 7.8, 7.6, 4.0, 33.3. II: 8.5, 3.8, 7.1, 5.9, 3.8, 29.1. III: 7.0, 3.3, 5.9, 6.2, 3.3, 25.7. IV: 9.1, 3.9, 8.4, 8.4, 3.1, 32.9. Palp: 5.2, 3.1, 4.0, –, 1.6, 13.9. Midwidths: femora I–IV= 1.2, 1.3, 1.6, 1.5, palp= 1.0; patellae I–IV= 1.2, 1.2, 1.3, 1.3, palp= 1.0; tibiae I–IV= 1.0, 0.9, 1.0, 1.2, palp= 1.2; metatarsi I–IV= 0.8, 0.7, 0.8, 0.7; tarsi I–IV= 0.9, 0.8, 0.9, 0.9, palp= 1.2. Abdomen 8.2 long, 6.1 wide. Spinnerets: PMS, 0.6 long, 0.4 wide, 0.1 apart; PLS, 1.3 basal, 0.9 middle, 1.5 distal; midwidths 0.9, 0.8, 0.6, respectively. FIGURES 9─12. Avicularia gamba sp. nov. 9─11 Male left palpal bulb (MZSP 31115). 9, prolateral, 10, retrolateral, 11, frontal. 12, Female spermathecae (MZSP 31116) dorsal. Scale bar = 1mm. Carapace: length to width 1.1; cephalic area moderately raised, thoracic striae visible. Fovea: shallow, straight, 1.0 wide. Carapace covered by short, slender setae and some long scattered setae mainly in cephalic region. Eyes: tubercle high, length 1.2, width 1.9. Clypeus absent. Anterior eye row procurved, posterior slightly recurved. Sizes and inter-distances: AME 0.52, ALE 0.58, PME 0.15, PLE 0.51, AME–AME 0.33, AME– ALE 0.27, AME–PME 0.08, ALE–ALE 1.27, ALE–PME 0.58, PME–PME 1.17, PME–PLE 0.03, PLE–PLE 1.50, ALE–PLE 0.23, AME–PLE 0.35. Ratio of eye group width to length, 2.0. Maxillae: length to width: 1.76; lyra absent. Cuspules: ca. 100 spread over ventral inner heel. Labium: length 1.0, width 1.4, with ca. 90 cuspules spaced by more than one diameter from each other on anterior third center. Labio-sternal groove shallow, flat, with two large sigilla. Chelicerae: rastellum absent, basal segments with nine teeth in row and some small teeth on promargin. Sternum length 3.9, width 3.3. Posterior angle sharp, but not separating coxae IV. Sigilla not visible. Legs: legs formula: I=IV II III. Clavate trichobothria on distal 2/3 of tarsi I–IV. Leg coxae: with sparse soft setae; no stridulatory or modified setae. Tarsi I–II fully scopulate, III with sparse setae and IV divided by narrow row of setae. Metatarsi I–II scopulate for distal 4/5; III for distal 2/3; IV for distal 1/3; IV divided by row of setae. Scopula hairs longest at lateral areas of tarsi and metatarsi, giving a spatulate aspect to the articles. Spines absent on all legs and palps. Claws: ITC absent; STC without teeth. Tibial apophysis absent. Urticating hairs: Type II on abdomen dorsum. Palp. Embolus slender, long, with abrupt curve to retrolateral side on apical third (Figs 9─11). Cymbium: two subequal lobes, prolateral one triangular, without spiniform process on apex. Color pattern: dark brown carapace bordered with light brown hairs; all legs and pedipalps dorsally dark brown. All appendages and carapace covered with light brown hairs with pinky sheen. All tarsi with central orange stripe. Sternum, labium, maxillae, coxae and legs ventrally brown. Leg rings on distal femora, tibiae and metatarsi pinkish. Orange hairs and broad red stripe over central area on dorsal brownish abdomen (Fig. C1). Description: Paratype female. Carapace 7.5 long, 6.8 wide, chelicerae 3.9. Legs (femur, patella, tibia, metatarsus, tarsus, total): I: 6.2, 4.0, 5.1, 4.5, 2.8, 22.6. II: 5.6, 3.6, 4.4, 3.9, 2.8, 20.3. III: 4.8, 2.9, 3.6, 3.6, 2.5, 17.4. IV: 5.9, 3.4, 5.3, 4.8, 2.7, 22.1. Palp: 4.4, 2.7, 2.8, –, 3.2, 13.1. Midwidths: femora I–IV= 1.5, 1.4, 1.4, 1.4, palp= 1.2; patellae I–IV= 1.4, 1.5, 1.5, 1.5, palp= 1.2; tibiae I–IV= 1.4, 1.4, 1.3, 1.3, palp= 1.2; metatarsi I–IV= 1.2, 1.2, 1.1, 0.9; tarsi I–IV= 1.4, 1.3, 1.3, 1.3, palp= 1.4. Abdomen 9.3 long, 6.8 wide. Spinnerets: PMS, 1.1 long, 0.5 wide, 0.3 apart; PLS, 1.5 basal, 0.9 middle, 1.5 distal; midwidths 1.1, 0.8, 0.6, respectively. Carapace: length to width, 1.1; cephalic area moderately raised, thoracic striae visible. Fovea: shallow, straight, 1.1 wide. As in male, except: Eyes: tubercle length 1.2, width 2.1. Clypeus absent. Sizes and inter-distances: AME 0.55; ALE 0.47; PME 0.25; PLE 0.38; AME–AME 0.32; AME–ALE 0.21; AME–PME 0.14; ALE–ALE 1.24; ALE–PME 0.43; PME–PME 1.11; PME–PLE 0.05; PLE–PLE 1.44; ALE–PLE 0.33; AME–PLE 0.39. Ratio of eye group width to length, 1.7. Maxillae length to width, 1.7. Labium: length 1.1, width 1.6, with ca. 100 cuspules spaced by more than one diameter from each other on anterior third at center. Chelicerae: basal segments with nine teeth on right side and 10 on left side, both with some small teeth on promargin. Sternum length 4.1, width 3.3. Legs: Tarsi I–III fully scopulate, IV divided by three-wide row of setae. Metatarsi III scopulate for distal 1/2, IV for distal 1/4; IV divided by row of three setae. Urticating hairs: Type II on abdomen dorsum. Genitalia: Two large spermathecae constricted at their base, slightly curved outwards and ending in rounded apex (Fig. 12). Color pattern: carapace brown bordered with light brown hairs; all legs and pedipalps dorsally brown; longer hairs light brown with pinky and blue sheen. All tarsi with U-shaped orange mark. Sternum, labium, maxillae, coxae and legs ventrally brown, longer hairs distally whitish. Leg rings on distal femora, tibiae and metatarsi pinkish. Light brown abdomen covered with long red setae with pinky sheen dorsally. Dorsal abdominal pattern: Large central longitudinal black stripe with zigzag edges having three red spots. Posterior spot larger than two anterior; central longitudinal black stripe fused to with three well defined lateral back stripes on each side (Fig. C2). Color pattern ontogeny: The color pattern of spiderlings and small juveniles is very similar among individuals of A. gamba sp. nov, A. diversipes and A. sooretama sp. nov.. Spiderlings have in the abdomen dorsum a longitudinal dark green stripe with a central long spot of the same color of the lateral abdomen (light yellowish green). Three ill-defined transverse stripes connecting to the longitudinal stripe are evident (Fig. C3). Slightly larger specimens have retained the metallic green pattern, but it is darker, mainly over the central carapace. Some lighter hairs can be seen over the lateral carapace, contrasting with the darker central area. In the abdomen dorsum, the central longitudinal stripe has zigzag edges, both longitudinal and transverse stripes become darker and the central spot inside it is yellow brown. The anterior part of the stripe bears two small spots (Fig. C4). In larger stadia, the metallic green/blue general pattern is still evident. The carapace is the same color as the legs and with light brown hairs on the lateral edges and coxae. The abdominal longitudinal black stripe with zigzag edge contrasts with the three red spots within it. The transverse stripes are now black and conspicuous (Fig. C5). In the adult female, the juvenile abdominal color pattern persists. The tarsi of all appendages have an orange U-shaped area; all legs and pedipalps have longer light brown hairs with pinkish and bluish sheen (Fig. C2). The adult male has a dark brown carapace, all appendages and carapace with light brown hairs with pinky sheen, all tarsi with a central orange stripe and light brown abdomen with orange hairs and a broad vivid red longitudinal stripe over the dorsocentral area (Fig. C1). Distribution: Known only for type locality, Elísio Medrado, State of Bahia, Brazil (Fig. 17). FIGURES 13─16. Habits.13─15 Avicularia diversipes adult female 13, Resting on a heliconid leaf. 14, Inside her retreat on a tree. 15, In a bromeliad. 16, Avicularia gamba sp. nov. juvenile inside its retreat on a tree. 13─15 from CEPLAC, Ilhéus, Bahia, Brazil. 16 from Elísio Medrado, Bahia, Brazil. Photos: 13, 14 G. Puorto, 15 C. Jared, 16 C.S. Fukushima. FIGURE 17. Map showing records of A. diversipes, A. sooretama sp. nov. and A. gamba sp. nov. on northestern and southeastern Brazil. Square = A. diversipes; triangle = A. sooretama sp. nov., star = A. gamba sp. nov. The gray area represents the approximate original distribution of Brazilian Atlantic Rainforest. Natural History: All the exemplars found in RPPN Jequitibá in Elísio Medrado, State of Bahia, were collected at night on the entrance of their retreat on the vegetation (Fig. 16). The retreats were constructed on different types of plants and their distance from the soil ranged from a few centimeters, in the case of retreat on a grass (Poaceae) to about 2 meters from the ground (retreat constructed on trees). These specimens were collected in a restricted area on the RPPN Jequitibá, totally less than 100 m from the first exemplar to the last one collected in a straight line of a trail. In the same trail, we found a female of A. diversipes walking on a trunk. The types of Mygale diversipes were formerly pinned dry specimens and despite their preservation condition and old age, we were able to recognise new material of the species. Surprisingly, a green/blue metallic sheen on the prolateral and retrolateral legs and the conspicuous orange medial stripe on tarsi and metatarsi can still be seen in the lectotype and is comparable with what we observed in recently collected specimens (Figs A1─A2). The spermathecal morphology of the recently collected material (Fig. 4) is also comparable with the lectotype. The type locality given in the description (State of Bahia) agrees with geographic range of the collected specimens (Fig. 17). Freyreiss, who collected A. diversipes syntypes, was in the southern State of Bahia before arriving in the Salvador region, which was the northern point of his trip into Brazil (Papavero 1971). sp. nov. has a broader distribution when compared to that of A. diversipes. However, despite recent intense collecting, there is but one old record (from 1956) for all the State of Rio de Janeiro (Fig. 17), indicating that the species may be very rare or even extinct in that state. This is the most meridional record for an aviculariine specimen and probably represents the southern geographical limit to the subfamily. More studies are needed to know their biology and habits, and to establish whether the species is rare or locally extinct. Systematic searches for specimens are needed. On the other hand, it might be too late to carry out those studies, therefore the inclusion of the species in CITES is recommended. The conservation status of A. gamba sp. nov. is even more problematic. We failed to find more specimens even though most aviculariine specimens in many scientific collections have been examined. Thus, the species is known from a single locality, in the State of Bahia. In fact, due to severe deforestation in the region, the area of occurrence of the A. diversipes, A. sooretama sp. nov. and A. gamba sp. nov. is actually a fraction of the total geographic distribution estimated above. Recent data show that the primary forest covers only about 7.26% of its original area in Bahia (Fundação SOS Mata Atlântica & INPE 2008). The rapid and intense deforestation of the region due to logging and forest clearing for cattle pastures and exotic crops (Araújo et. al. 1998; Argôlo 2004) transformed the area into a highly fragmented vegetation mosaic. The alteration of the habitat complexity caused by forest disturbance is known to affect the diversity, structure and dynamics of the arboreal spider communities (Floren & Deeleman-Reinhold 2005). Even after decades of forest regeneration, the spider diversity does not itself recover and there is a dominance of species characteristic of open vegetation (Floren & Deeleman-Reinhold 2005). Thus, the arboreal spider community, including here A. diversipes, A. sooretama sp. nov. and A. gamba sp. nov., can be specifically and seriously affected by deforestation. Restricted geographic distribution (Fig 17) of these species and the severe habitat destruction occurring in the area make the populations’ survival particularly difficult. Adding to this, A. diversipes has been noted to be one of the more recent targets of international animal trafficking, under the name Avicularia fasciculata Strand 1907, a misidentification. Rapid checks on the internet (17 October 2008) using Google tool (www.google.com) to search with the words "Avicularia fasciculata" rendered 1.300 entries. Of these, 152 sites were considered distinct by the search engine and were examined. In roughly 13 sites, there were advertisements for the sale of spiders of this species. Some of these were bulletin boards with several offers and searches of this specific spider species. The dates of the advertisements indicate that the species appeared in the pet trade by mid-2007. There was a rapid increase in offers and searchers for specimens after its first appearance. In a specific bulletin board, there were 56 advertisements in roughly one year, by 10 different users. Another 21 users posted 63 requests for specimens in the same period. Individuals of A. diversipes seem to have been first introduced in Germany by the end of 2006 and beginning of 2007, as indicated by the high offer of specimens in that country, the origin of the oldest advertisements and correspondences between users of the bulletin boards services. The species is sold now in different countries such as United Kingdom, U.S.A., Netherlands, Poland, Hungary, Turkey, Taiwan, China, and it is going to be introduced for sale in Japan. Prices vary from 25.00 Euros (first instars) to 120.00 Euros (adults) in Europe, reaching 1,600 Euros for a specimen for sale in China. In bulletin boards, this species is one of the more expensive, being surpassed only by some Poecilotheria Simon 1885 species. Avicularia diversipes has a very attractive metallic glow and, clearly, is considered rare by hobbists, having a strong appeal to them. Natural population sizes can be affected if the high demand as well as price obtained in the market encourages the capture of specimens to supply it. Despite A. diversipes being the single species among these three that are currently in the pet market, this factor needs to be discussed when considering the conservation of all three species. The depletion of A. sooretama sp. nov. and A. gamba sp. nov. small populations by the pet market would cause serious damage. Thus, the inclusion of all three species under the threatened species list in CITES is recommended. The biological importance of Brazilian Atlantic rainforest is widely accepted because of its highendemism (Myers et. al. 2000) and diversity higher than most of the Amazon forests (Morellato & Haddad 2000). However, despite all efforts to protect this biome, much is yet to be done. In the distributions of A. sooretama sp. nov., A. gamba sp. nov.and A. diversipes (Fig. 17), few federal protected areas for the former and none for the latter two species exist. Most areas from which A. diversipes and A. gamba sp. nov. were recorded are privately owned properties; fortunately, some are RPPN's (Private Natural Heritage Reserves), private properties protected under the owner's initiative, by means of a formal recognition by federal government. The creation of protected areas by the Brazilian government in the area between Salvador and Ilhéus, State of Bahia, is imperative. Equally important, however, are also the attempts to eliminate animal trafficking. All available indications we have indicates that A. diversipes was introduced recently into the pet trade by a very well known European pet trade collector who is frequently in Brazil. Rigid control needs to be taken by authorities to prevent illegal collection of specimens to be commercialized by well known European pet trade collectors in Brazil. The destruction of the natural habitat of these spiders, their restricted distributions as well as their commercialization are enough reasons to include A. diversipes, A. sooretama sp. nov and A. gamba sp. nov in the threatened list of CITES and IUCN. 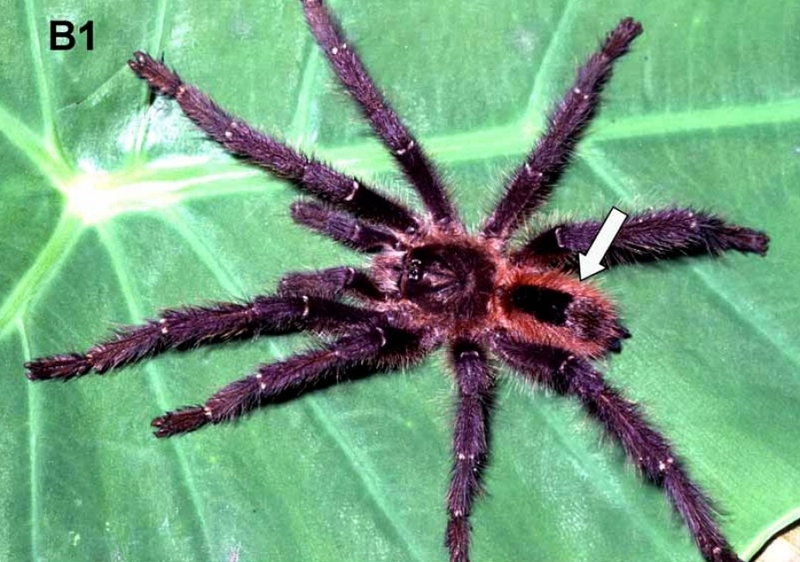 At present, only Brachypelma Simon 1891 species (Yáñez & Floater 2000) and two Aphonopelma Pocock 1901 species are included in Appendix II of CITES (2008). In the IUCN (2008) list, there are 15 theraphosid species listed in different categories, only one from the New World. The inclusion in these lists is important to attract the attention of the international community to preserve the Brazilian species and inhibit their trade. Furthermore, the creation of legally protected areas in Ilhéus and nearby may help not only in the conservation of A. diversipes but in maintaining the biodiversity of a highly threatened area which shows great ecological importance to invertebrate conservation as a whole (Ministério do Meio Ambiente 2000). The taxonomic distinctiveness of Avicularia diversipes, A. sooretama sp. nov. and A. gamba sp. nov. should be considered as an important factor to protect the species (Vane-Wright et al. 1991; Faith 1992). They are probably a distinct lineage with unique characteristics, distinguishing them from all other Avicularia species. Thus, their conservation is important to maintain the biological diversity of the group (Faith 1992). Acknowledgments We thank Elbano Paschoal and Maria Theresa S. Stradmman from the GAMBA—Grupo Ambientalista da Bahia, for permission to collect, aid in the field work at Reserva Jequitibá and for plant identification; Henrique and Lucélia Berbert for the permission and aid in field work at Reserva da Serra do Teimoso. CEPLAC is thanked for allowing field work at Ilhéus. Antonio Argôlo and Paulo Terra helped in many different ways in trips to Ilhéus; Giuseppe Puorto, Francisco Luis Franco, Ricardo Pinto-da-Rocha and Antonio Brescovit helped in field work. IBAMA for the collection permits. Giuseppe Puorto and Carlos Jared are thanked for allowing the publication of their photos. We thank Roberto Nagahama and the Arachnid collection team from MNRJ (especially Alessandro Giupponi and Adriano Kury) for collecting material. We are also grateful to Adriano Kury and Jason Dunlop for the loan of specimen and to Ricardo Pinto da Rocha for providing a repository for specimens. Thanks to those participants in the MNRJ arachnids laboratory for helping and supporting our visit to the collection. Thanks to Kátia M. Faria who kindly made the illustrations. We also thank Martha Yáñez and Robert Raven for valued comments on the manuscript. Support: FAPESP 03/12587-4 and CNPq Research Fellow – Brazil for RB and FAPESP 06/58326-5 for CSF. Common names: english: Amazon Sapphire Pink Toe, Bahia purple-blue bird-eater. Scientific synonyms: Avicularia fasciculata (misidentification). FIGURE A1. Avicularia diversipes adult female. Orange arrow = conspicuous orange stripe along last two articles of legs. White arrow = brownish areas on abdomen. Bar = 9 cm / 3.5 in. Photo: C. Jared..
iridescence on legs. Orange arrow = conspicuous orange stripe along last two articles of legs. Bar = 7 cm / 2.8 in. Photo: C. Jared. FIGURES A4–A5. Avicularia diversipes spiderlings. Note the abdomen pattern with well-defined transverse stripes connecting to central longitudinal stripe with zigzag edge. A4, Yellow arrow = central light yellowish green spot on the abdomen. A5, Red arrow = central red spot on abdomen. Photos: A4 R. Bertani, A5 G. Puorto. Size (adult): ca. 9 cm / 3.5 in, with outstretched legs. Coloration (juvenile): Larger juveniles have overall coloration brownish and the two last articles of the legs with a vivid orange stripe (Fig. A3). Spiderlings have an overall metallic green color; abdomen with a central longitudinal darker green stripe bearing a long light yellowish green spot (Fig. A4, yellow arrow) and with four transversal stripes connecting to the longitudinal stripe (Fig. A4). Larger individuals have abdomen with central longitudinal black stripe with zigzag edges bearing a long central orange spot and four well-defined transversal stripes connecting to the longitudinal stripe (Fig. A5, red arrow). Distribution: Brazilian Atlantic rainforest, State of Bahia, Brazil (Fig. A6, red area on map). Wild population: Few populations known in a very restricted area in Southern Bahia, Brazil. Captive population: No data available, but specimens are maintained as pets in many countries. Trade: Traded in all stages alive (adults, juveniles, spiderlings and inside eggsacs) for the pet market. Similar species: Regardless of its very distinctive appearance, it can be misidentified as another Avicularia species (Fig. A7) or as Iridopelma and Pachistopelma species. Due to its orange marked legs, it can be confused with some Psalmopoeus species (Fig. A8). However, Psalmopoeus species have different body pattern in adults and juveniles individuals (Fig. A8). Avicularia diversipes juveniles can be also confused with Poecilotheria individuals (Fig. A9) but can be distinguished from them by the different body pattern (Fig. A9). FIGURE A6. Map showing A. diversipes distribution on State of Bahia, Brazil (red area). FIGURES A7–A9. A7, Avicularia sp. adult female. Bar = 10 cm / 4 in. A8, Psalmopoeus irminia juvenile. Note the similar orange marks on legs but the different abdominal pattern. Bar = 9 cm / 3.5 in. A9, Poecilotheria sp. juvenile. Note the different body pattern. Bar = 9 cm / 3.5 in. Photos: C. S. Fukushima. FIGURE B1. Avicularia sooretama adult male. White arrow = broad black stripe on abdomen. Bar = 10 cm / 3.9 in.Photo: R. Bertani. FIGURES B2–B3. Avicularia sooterama. B2, Adult female. Bar = 6.0 cm / 2.4 in.. B3, Immature. Bar = 1.9 cm / 0.74 in. Pink arrow = central orange spot on abdomen. Photos: R. Bertani. FIGURE B4. Map showing Avicularia sooretama distribution on extreme South of State of Bahia to Southern State of Rio de Janeiro, Brazil (blue area). Size (adult): ca. 10 cm / 3.9 in, with out stretched legs. Coloration (adult): Carapace dark brown bordered with light brown hairs. Male: All appendages and carapace covered with light brown hairs with pinky sheen; reddish hairs and a broad black central longitudinal stripe over a red abdomen (Fig.B1, white arrow). Female: All appendages dorsally brown and light brown hairs with pinky sheen; light brown abdomen with a large longitudinal central black stripe with zigzag edges in which lies a red spot on the posterior half and three ill-defined black stripes connected to the central one on each side (Fig. B2, pink arrow ). Coloration (juvenile): Spiderlings have overall metallic green color. Juveniles have a similar pattern as the female, but the legs have more conspicuous metallic sheen (Fig. B3). Distribution: In the Brazilian Atlantic rainforest, extreme South of State of Bahia to Southern State of Rio de Janeiro (Fig. B4, blue area). Wild population: Few populations known in a very restricted area in Southern States of Bahia and Espírito Santo, Brazil. Captive population: No data available. Trade: No data available. However, as other tarantulas species, can be possibly traded in all stages alive (adults, juveniles, spiderlings and inside eggsacs) for the pet market. Similar species: Regardless of its very distinctive appearance, it may be misidentified as another Avicularia species, including A. gamba. The abdomen has a large longitudinal central black stripe with zigzag edges in which lies, on the posterior half, a red spot (females and juveniles) and a broad black longitudinal stripe on a red abdomen (males)are noted differences. It can also be misidentified as Iridopelma or Pachistopelma species. Size (adult): ca. 10 cm / 3.9 in, with outstretched legs. Coloration (adult): Carapace dark brown bordered with light brown hairs. Male: All appendages and carapace covered with light brown hairs with pinky sheen; orange hairs and a broad longitudinal central red stripe on brownish abdomen (Fig. C1, white arrow). Female: All appendages dorsally brown and light brown hairs with pinky sheen; light brown abdomen with a longitudinal central black stripe with zigzag edges bearing three red spots; three welldefined dark stripes connected to the longitudinal stripe can be noted on each side (Fig. C2, blue arrow). orange spots (Fig. C5, red arrow). Distribution: Known only from a single locality, in the Brazilian Atlantic rainforest, State of Bahia (Fig. C6, green area). Wild population: Few individuals known in a very restricted area in a city near Salvador, State of Bahia, Brazil. Captive population: No data available. Trade: No data available. However, as other tarantulas species, can be possibly traded in all stages alive (adults, juveniles, spiderlings and inside eggsacs) for the pet market. Similar species: Regardless of its very distinctive appearance, it may be misidentified as another Avicularia species, especially in the case of juveniles of A. diversipes and A. sooretama. The abdomen with a central longitudinal black stripe with zigzag edges in which lies 3 red spots is a noted difference (Fig. C5, red arrow). It can also be misidentified as a Iridopelma or Pachistopelma species. FIGURES C1–C2. Avicularia gamba. 1, Adult male. Bar = 10 cm / 3.9 in. 2, Adult female. Bar = 5.2 cm / 2.0 in. White arrow = broad red stripe on abdomen. Blue arrow = three red spots on abdomen. Photo: R. Bertani. FIGURES C3–C5. Avicularia gamba juveniles. C3, Bar = 1.9 cm / 0.76 in. C4, Bar = 2.3 cm / 0.9 in. C5, Bar = 3.5 cm / 1.40 in. Red arrow = three red spots on the abdomen. Yellow arrow = central spot light yellowish green on the abdomen. Photos: C. S. Fukushima. FIGURE C6. Map showing Avicularia gamba distribution on State of Bahia, Brazil (green area). Araújo, M., Rocha, R., Alger, K. N. & Mesquita, C. A. B. (1998) A Mata Atlântica do Sul da Bahia: situação atual, ações e perspectivas. Série Cadernos da Reserva da Biosfera da Mata Atlântica, São Paulo, 8, 1─42. Argôlo, A. J. S. (2004) As serpentes dos cacauais do sudeste da Bahia. Editora da UESC, Ilhéus, 259 pp. Ausserer, A. (1871) Beiträge zur Kenntniss der Arachniden-Familie der Territelariae Thorell (Mygalidae Autor). Verhandlungen der k. k. zoologisch-botanischen Gesellschaft in Wien, 21, 117─224. Bonnet, P. (1955) Bibliographia araneorum. Toulouse, 2(1), 1─918. III. Available from: http://www.cites.org/eng/app/E-Jul01.pdf (accessed 26 March 2009). Faith, D. P. (1992) Conservation evaluation and phylogenetic diversity. Biological Conservation, 61,1─10. Floren, A. & Deeleman-Reinhold, C. (2005) Diversity of Arboreal Spiders in Primary and Disturbed Tropical Forests. The Journal of Arachnology, 33, 323─333. index.php?section=info&action =mata (accessed November 2008). http://www.iucnredlist.org/ (Accessed 26 March 2009). Koch, C. L. (1842) Die Arachniden. Nürnberg, Neunter Band, pp. 57─108, Zehnter Band, 1─36. Koch, C. L. (1850) Übersicht des Arachnidensystems. Nürnberg, Heft 5, 1─77. Mata Atlântica e Campos Sulinos. DelRey Publishing, Belo Horizonte, 40 pp. Morellato, L. P. C. & Haddad, C. F. B. (2000) Introduction: the Brazilian Atlantic Forest. Biotropica, 32(4b), 786─792. conservation priorities. Nature, 403, 853─858. São Paulo, 1, 216 pp. Amazons. Proceedings of scientific meetings of the Zoological Society of London, 1896, 716─766. Platnick, N. I. (2000) Estimated spider numbers. American Arachnoloy, 61, 8─9. /research.amnh.org/entomology/spider/catalog /index.html (accessed November 2008). Museum of Natural History, 182, 1─180. Raven, R. J. (2005) A new tarantula species from northern Australia (Araneae, Theraphosidae). Zootaxa, 1004, 15─28. Roewer, C. F. (1942) Katalog der Araneae von 1758 bis 1940. Bremen, 1, 1─1040. Roewer, C. F. (1955). Katalog der Araneae von 1758 bis 1940, bzw. 1954. Bruxelles, 2, 1─1751. Simon, E. (1864) Histoire naturelle des araignées (aranéides). Paris, 1─540. Simon, E. (1892) Histoire naturelle des araignées. Paris, 1, 1─256. Vane-Wrigth, R. I., Humphries, C. J. & Williams, P. H. (1991) What to protect? - Systematics and the agony of choice. klaasi (Araneae, Theraphosidae) in Mexico. Biodiversity and Conservation, 9, 795─810. e perspectivas. Série Cadernos da Reserva da Biosfera da Mata Atlântica, São Paulo, 8, 1─42.